Posts tagged " service "
I enjoy visiting New York where I inevitably encounter many stimulating minds and meet many charming people. For a large part, though, New Yorkers are rude and customers in New York are subjected to surliness. This is not true for all cities. People in places like Nashville smile and show a desire to please. Great customer service tends to be found in communities with healthy marriage statistics. This is no coincidence. One reason is that successful spouses are better equipped to provide exemplary customer service at work; they do it all the time at home. Furthermore, young people raised by parents in a happy marriage have learned how uplifting serving others can be. Such youngsters are more likely to serve customers with smiling enthusiasm. Most of us have experienced truly horrid customer service. You might have been ignored by the two sales girls on the floor who are too busy giggling with one another to attend to you. It might be an arrogant public servant trying to make you feel insignificant or who sees no connection between his actions and his paycheck. Vile customer service extracts a cost in both economic and human terms. Courteous customer service lubricates the wheels of commerce and fights the friction that is found in human interaction. If engaging a plumber to repair my faucet was a pleasant experience, I am more likely to hire him again rather than try to fix it myself. That way I can spend that time on what I do best instead of struggling with recalcitrant pipes. In human terms, whether one returns home at the end of a day beaten or elated depends to a great extent on whether one feels uplifted by respectful human interaction. Winning the deal, but from an overbearing, pompous bully (male or female) leaves the sales professional feeling oppressed. Imagine what your life would be like if every person with whom you came into contact made you feel valued. Imagine what you could do for others if you sought ways to make everyone with whom you interact, feel appreciated. Instead of complaining about how we are served by others, we could try focusing on how well we do the serving ourselves. The customer can also find ways to serve the vendor—a kind word of gratitude does just that. The key to both marriage and customer service is one and the same. Taking a spouse for granted and expecting only to be served is surely a recipe for marital disaster. Service should go both ways and expressing deeply sincere appreciation is one profound form of service. Those who see serving as degrading and subservient will be less successful with both spouses and customers. Jews have always been disproportionately successful in business partially because they understood the importance of customer service. Early in our history in America, we Jews became small merchants. From the barrows of the Lower East Side of New York to the main streets of nearly every small town across America, people felt comfortable purchasing from the Jewish storekeeper. One of my Southern Baptist friends, a pioneering medical industries investor, recalls growing up in the South, in the town of Natchez, MS. His anecdotes highlight the warm relationships between local Jewish merchants and their Christian customers. Where did Jews learn customer service? Judaism calls the process of praying to God—a prayer service. Christianity has of course adopted this nomenclature too; we all serve God and we attend services. Serving God helped Jews understand the inherent Godliness of serving His children, other people. Serving God and serving customers are closely related. People who are obsessed with celebrities would do almost any favor imaginable for their preferred idol. They would even change diapers for Angelina’s tot or baby-sit Madonna’s children. Serving someone’s children is a way of getting close to that someone. Praying is not just about asking God for various favors. It is expressing profound appreciation to Him; serving Him. Serving is a God-given process of expressing the deepest yearnings of our souls. After all, no animal consciously serves another. Serving is a uniquely human gift and serving God makes us feel closer to Him. Serving other people, His children, does the same. Furthermore, service to others is an element of life’s essence. Indeed doing things for another person is surely part of creating life. For spiritually attuned humans, the act of marital intimacy with all its life creating potential, remains a union in which each individual is preoccupied with enhancing the joy of the other. God’s marital message for future parents is that there is no pleasure that exceeds providing for another. What a perfect preparation for the arrival of new life that will be the beneficiary of its parents’ desire to provide for its every need. This is why the Hebrew word for love—ahav, when broken down to its component parts, means—I give. These ancient ideas helped dispel the notion that there was something shameful or degrading about serving someone else. Some cities still cherish these eternal values while others have rejected them. It cannot be a coincidence that New York, a triumph of secular liberalism with a high proportion of its inhabitants single, also offers such dreadful customer service. Learning that serving others is one of life’s ultimate thrills could be the key to repairing both customer service and marriage. Being aware of how the words we use affects others is one way we serve them. The widespread use of profanity shows a willingness to selfishly pollute the environment around us. Alternatively, choosing kind and caring words brightens others’ days. 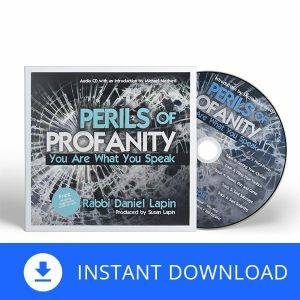 Discover the power of words and concrete tips to improve your own language in Perils of Profanity: You Are What You Speak. 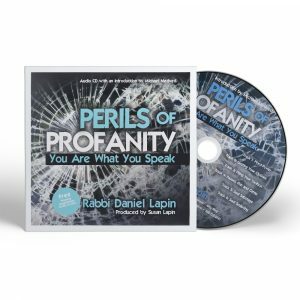 On sale now, this audio CD can improve your financial and love life as it guides you to properly use the Divine gift of speech.